The Indiana Pacers and Atlanta Hawks series is one that has got lost behind the New York Knicks and Boston Celtics throw down. The Indiana Pacers defeated the Hawks on Wednesday, 106-83 to take a 3-2 series lead. This was a game that was lost midway in the second quarter by the Hawks. The Hawks lost their mojo and could not find their way back after the second quarter attack by the Pacers. 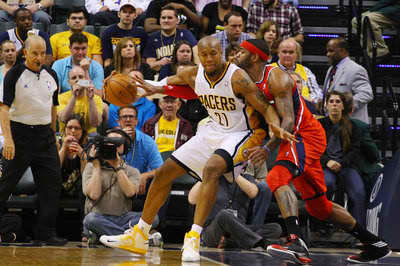 Paul George and David West scored 24 points each in the win. George posted another double double with 24 points, 10 rebounds, and five assists. NBA’s Most Improved Player has been a dominant force for his team throughout this series. Indiana’s starters and supporting cast also played exceptionally well. Hibbert contributed 18 points, 9 rebounds while George Hill added 15 points, 10 assists. The Atlanta Hawks witnessed another game where their 3-point game was off. The Hawks went 3 of 14 from 3-point territory with their three point specialist, Kyle Korver, going 1-3. The Hawks have had in my opinion a disappointing season. A team that use to be full of energy and excitement has been a team of confusion, injuries, and tension. Josh Smith and Al Horford are thought to be the leaders of this team, but scoring only 14 points in games and against an aggressively physical team such as the Indiana Pacers will not cut it. The tension is high and the officials whistles are blowing, the Atlanta Hawks must find a way to get their head in the game and not worry about the physicality of the Pacers, because that’s who they are. The Hawks must fight back, pound back, push back whatever it takes to take this series seven games. If not, what an end this would be for the Hawks. The Hawks face elimination on Friday at Philips Arena. This is a series where the home team has won every game, maybe the home crowd will push their team to victory.